It is with great sadness that we heard the news of Ralph's passing last week. Not only was he a great musician, he was a wonderful friend to me and Julia and, along with so many others on the folk scene, we will miss him greatly. Rest in peace dear Ralphie. Nic, his daughter Helen and their friend Jas are embarking on a project to rejuvenate the folk club scene by running their own unique, intimate club in Exeter city centre. Their aim is to promote fresh new talent with a folk influence. Please find them on Facebook and watch this space for up and coming guest information. In association with O&T Agency, we are delighted to announce The Nic Jones Trio festival appearances for 2013. 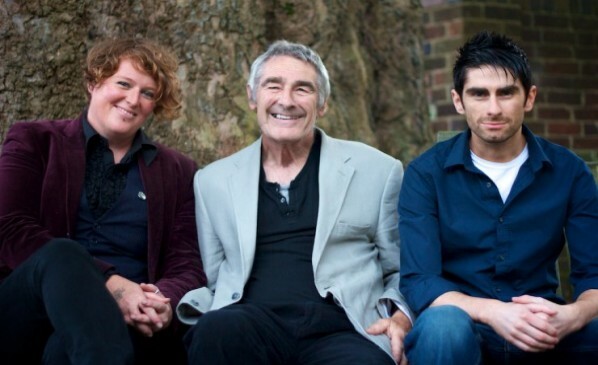 The Nic Jones Trio are Nic Jones, his son Joseph on guitar and Belinda O’Hooley on piano and accordion. Nic has been nominated in the BBC Radio 2 Folk Awards 2013 for 'Folk Singer of the Year'. The awards take place at Royal Concert Hall, Glasgow on 30th January. Limited edition now available exclusively from Mollie Music Shop – all proceeds going to Nic and only Nic. Nic was very chuffed to be awarded the EFDSS Gold Badge this month. It will be presented to him sometime during the next year at an event yet to be planned. So watch this space. We are pleased to announce the launch of our new, improved website combining the Nic Jones Official Site and Mollie Music Records into one website. You can read Nic’s biography, find out about his recordings, look at photos taken during his career and read reviews written about him. CDs and songbooks featuring work by Nic and the bands he performed with (such as The Halliard) together with those of fellow band members and friends are available to buy online from our shop. A range of useful links related to folk music and audio in general are also provided.